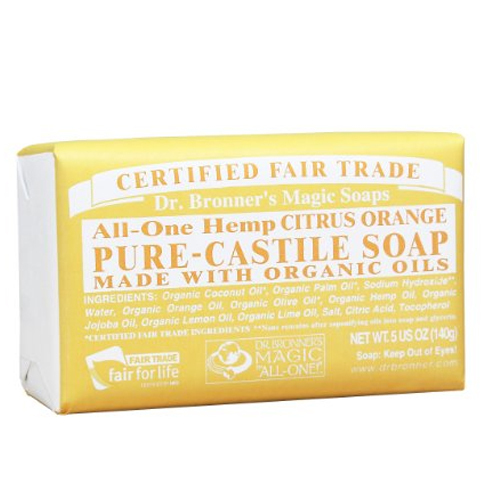 Dr Bronner`s Citrus Orange Castile Soap Bar contains a combination of organic extra virgin coconut, jojoba and hemp oils, together with pure essential oils, creates a unique soap that cleans effectively without being aggressive. All oils and essential oils are certified organic to the National Organic Standards Program. Wrapped in 10% hemp-flax & 90% post-consumer recycled paper from Living Tree Paper Co.
Organic Coconut Oil*, Organic Palm Oil*, Sodium Hydroxide**, Water, Organic Orange Oil, Organic Olive Oil*, Organic Hemp Oil, Organic Jojoba Oil, Organic Lemon Oil, Organic Lime Oil, Salt, Citric Acid, Tocopherol. Massage the bar of soap onto wet skin, to create a lather. Rinse, pat gently to dry and moisturise. 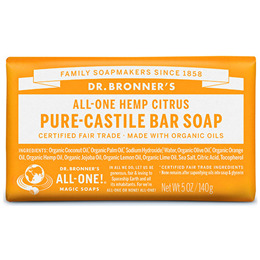 Below are reviews of Dr Bronner`s Citrus Orange Castile Soap Bar - 140g by bodykind customers. If you have tried this product we'd love to hear what you think so please leave a review.